For the tartiflette, preheat oven to 200C/400F/Gas 7. Cook the potatoes in a saucepan of salted boiling water for 5-10 minutes, or until tender. Drain and set aside to cool slightly. Meanwhile, heat a frying pan until hot and fry the bacon, shallots and garlic for 4-5 minutes, or until golden-brown. Deglaze the pan with the white wine and continue to cook until most of the liquid has evaporated. 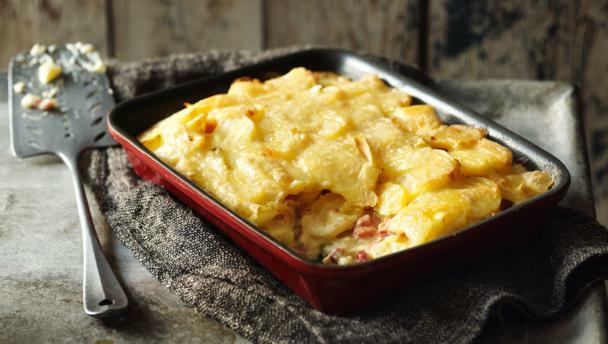 Slice the potatoes thinly and layer into an ovenproof gratin dish with the bacon mixture. Pour over the double cream. Season with salt and lots of freshly ground black pepper. Layer the Reblochon slices on top. Bake in the oven for 10-15 minutes or until the cheese is golden-brown and bubbling.